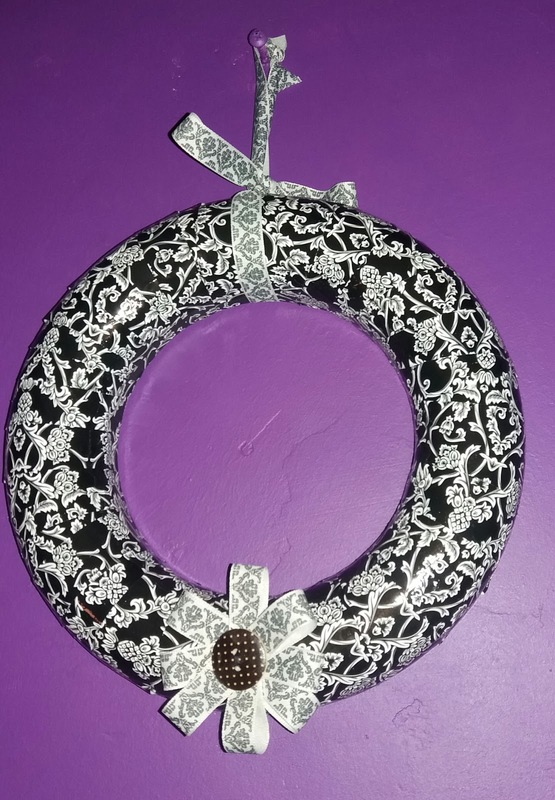 Tales From A Geordie Goth : My Christmas Decor. Sorry for the late post this weekend has been busy and turbulent, so best left unsaid. This week I wanted to post my Christmas Decor. But I have to mention Ms Misantropia post it feels as though she kicked off this week's countdown with her wonderful post on decor and crafts. This year, I wasn't sure if I wanted to decorate after watching a couple of episodes of Kirstie's Homemade Christmas and attending a couple of Christmas event in my local area I've succumbed to the Christmas spirit and wanted to decorated. What can I say you wave the home crafts carrot in front of me, no matter the season I'm going to be persuaded. 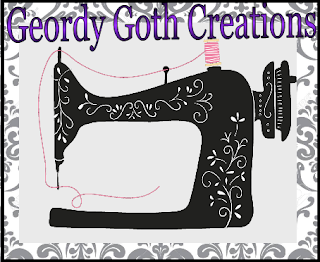 I know other bloggers are doing the Creepmas, which I think is a great idea for us spooky people but it doesn't really appeal to me. I don't really do a spooky Christmas and I'm not a Christmas enthusiast either. I do like a quiet and a simple Christmas and I think it reflected in my decor. Also, the boyfriend stated he didn't want to come into Santa's Grotto, so I've had to consider his feelings. Last year I didn't bother with a Christmas tree exactly upcycled my Halloween Tree and the results still look great. It did lead to some hilarious comments from my family and friends. So this year it seemed only fitting to purchase a proper a tree. I really wanted a small black Christmas so I found one on Asda's website for a fiver it included lights and small, so I ordered it last week. I always had this idea for my Christmas should be unique, individual and would have a storey of its own. Mostly everything on my tree has come from some craft fair, Christmas fair, Christmas market and even a church fete. It's all been hand crafted in some way. I'm a bit of sucker for something handcrafted as I like to support independent vendors where possible. These two. I got a local Christmas Fair on the weekend; I fell in love with the little polar bear. After coming back on Friday night the boyfriend thought the Christmas tree would look good with a Santa's hat I have to agree. Since the lights are now it's been taken off. . 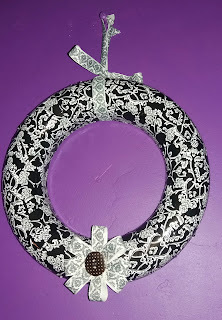 I recently made this on the weekend as I wanted a wreath so I decoupaged a wreath using left over wrapping paper. I also made a damask flower a sewn a button on. 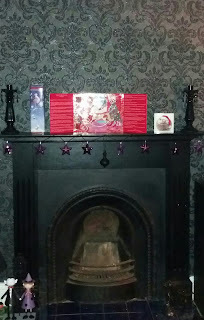 On my fire place I created a small garland with purple star from Christmas tree boubbles with black string. 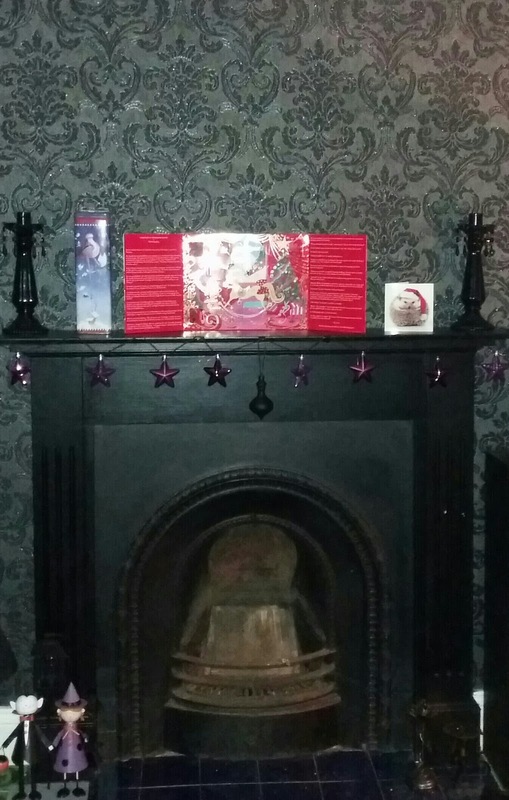 I've got my advent calander on thte mantle piece. Recently, I had wood delivered so I'm look forward to having a real log fire for Christmas. I know it's not a lot but what can I say I like it quite simple and sometimes that's just nice. Maybe the more Christmas' I'll spend the here the more adventious I may get. I hardly put out any decorations this year ... some years it's decorated to the rafters and others not so much. I find that after doing Xmas markets, I'm not so inclined to decorate our own house! Burned out by then, I suppose. It's nice you support all the makers by buying their ornaments! I understand that I didn't really want I was in two minds about decorating but I think I've just got it right. I love going to Christmas market their amazing. Very festive! I especially like the felt 'n burlap hearts, the purple one in particular! We don't usually put up too much decoration and this year we have even less..but I do love your decorations^^ And to make up for the lack of decor, we have a huge Christmas tree, that look like a colorful mess every year...:D We collected so many ornaments over the years - gifts, inheritance, artisan and DIY pieces, stuff we me and my brother made in kindergarden and school... - it gets very colorful...:D I'll post a pic on the 24th, because that's when we usually set the tree up in Hungary. Wow that's interesting you don't put the tree up until the 2th December. I've seen some people putting their decorations up since October, which is way too early I think the beginning of December fine but anything earlier is just ridiculous. That sounds really cool that you have a large tree with load of stuff lol. I thinks that's a good idea. to focus on the tree. I look forward to seeing. your tree. Thanks you I'm glad you like them. Looks lovely, quirky and very individual. I'm not a huge fan of Christmas, I actually find it quite overwhelming and it's all a bit busy for me (and I have a tetchy family). But then I do live in my own Fortress of Solitude! Sorry I've not been commenting much recently. Love your outfit post too. Thanks. I wanted to reflect my favourite colours lol. I'm sucker for black and purple. I think sometimes you have to break with tradition. Yeap, over in Geordie Goth Manner both and his lordship aren't the most in enthusiastic. I think it just brighten the place up and creates a bit interest, especially since our house isn't fully finished as such. P.s Don't worry life gets busy it happens lol. Also meant to say I love your fireplace, I'm a sucker for old ones and it looks lovely. There is nothing better than getting the logs on when the weather is cold (we've got an Edwardian one in our living room) - it just makes the room so homely and snug. I love the old fire place it's part of the reason I fell in love with the place. It's a shame alot of thevold features have been ripped out but with in time. I can only agree with everyone else - that fireplace/mantel rocks! What theme were you thinking for next weekend, so we can plan our blog posts? I love, love, love everything!! And, you know why?? ?....because it's you!!! So many people decorate, to decorate. And, things are cookie cutter! Your decorations mean something! I really love everything!! Big Hugs! I agree, your fireplace rocks! I love alllll the wonderful decorations! Thanks that really nice of you to see. Beautiful! I love seeing everyone's trees because they are reflective of who they are; and that mantel/fireplace is stunning. Thanks thay fire place is getting some complaints. I guess your right about decor, I would never of thought of that before. Its been nice seeing what other people have done.